The chill of the approaching winter has begun to move in, but the harvesting of the farm fields around us still goes on, as it does every fall. Even with snow flurries in the forecast and the TV meteorologists telling us we are having December weather in November, the hum of farm machinery traversing the surrounding fields is in the air. For me, it is one of the sweetest sounds of the season. That might seem odd coming from someone who writes about and values quiet, but during the harvest, a churning combine is less a noise that intrudes on the peace of our rural setting and more a sound that evokes pleasant associations. When the soybean crop – or wheat or corn – is taken off our little plot of land, not only do we happily anticipate the possibility of extra income, but we are reminded of even greater gifts: the land that connects us to family and the big-hearted people who work it for us. Since moving 10 years ago onto acreage that has been in my husband’s family for a few generations, we often have recalled with appreciation those who lived here before we did without the conveniences we enjoy. We also have known – in bounds – the generosity of our farmer neighbors. Besides planting and harvesting our field in spring and fall, they have moved snow for us in the winter and helped us fell dead trees during other seasons. In the summer and beyond, their garden has provided us with everything from beets to zucchini, not to mention the jams and other canned goods that come from their kitchen. Even when we try to reciprocate with a bottle of wine or a box of pears, it’s impossible to return home without a jar of preserves or a head of cabbage. Since then, we have had many other opportunities to stand in awe of what they do and the ease with they seem to handle rural life. For them, it’s all in a day’s work, but for us, it’s an art – and something to be admired. 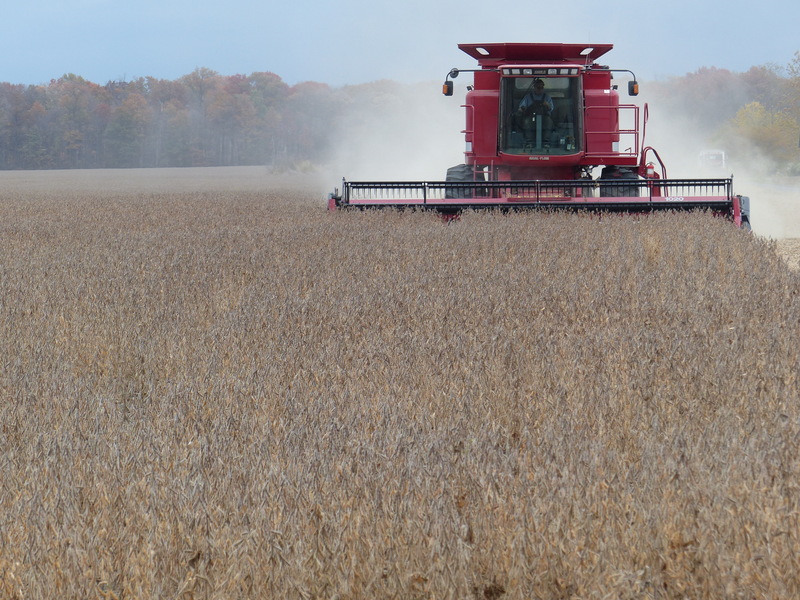 As I snapped photos of their combine making its way through the field a few weeks ago, I was captivated by the sight of the hulking machine stirring up dust as it cut, winnowed, and collected the beans. It struck me that, even in the age of mechanization, farming still has a certain romance about it. Our neighbors may not take to the fields singing songs while they work, as portrayed in the idealized rural TV series, Lark Rise to Candleford, but they face the same elements their forebears did, knowing that at the end of the day, they are at the mercy of weather and wind, and whatever price the market will bear. 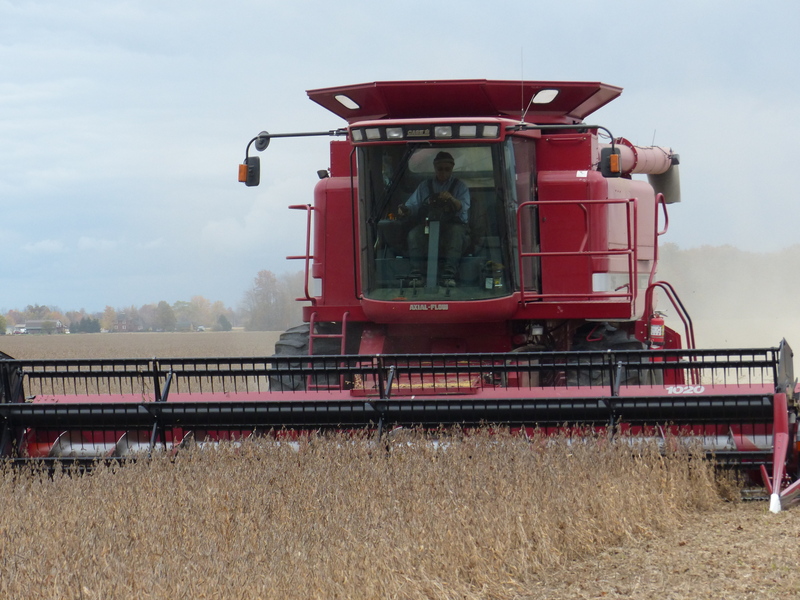 This year, I got an even closer look at the harvest than my camera would provide when I was invited aboard the combine for a few passes up and down the field. 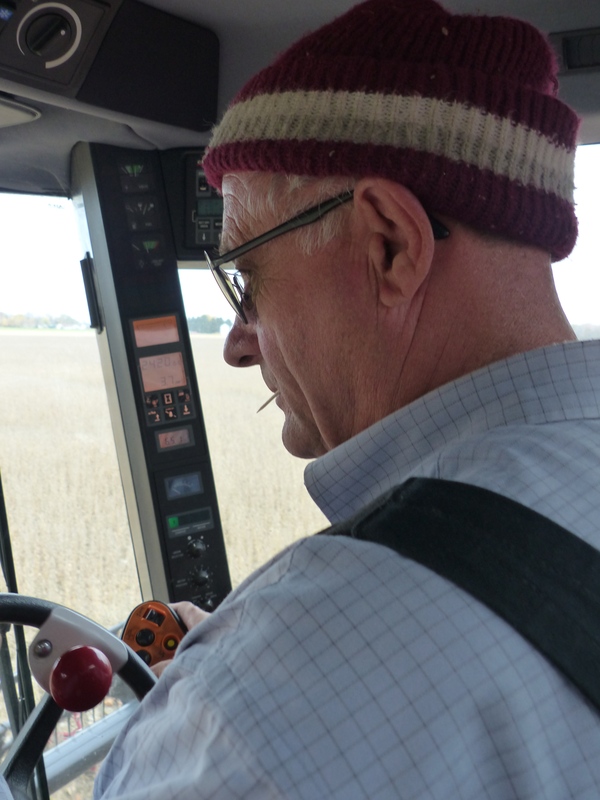 In the interim, I learned what combines were like when our neighbor was a boy and how when he drove his first one as an adolescent, it was not in an enclosed cab with a radio, but on a tractor exposed to the open air. 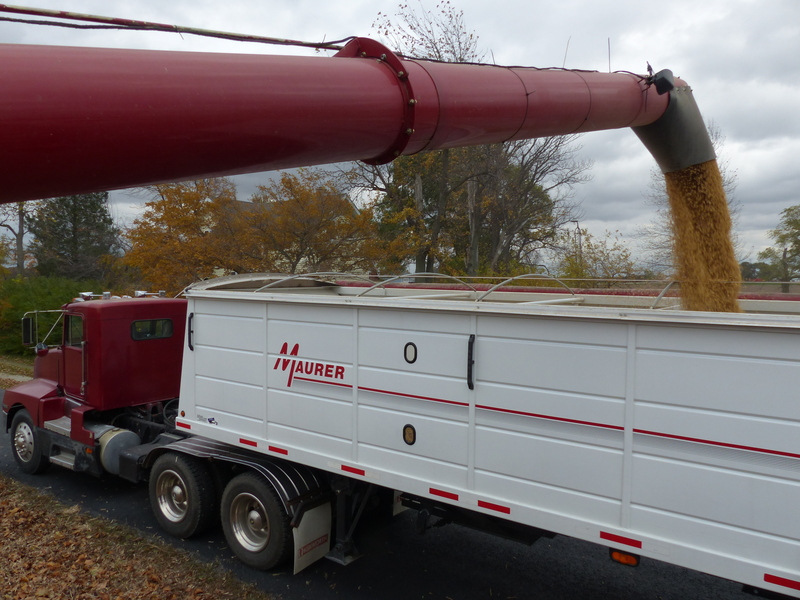 As I watched the beans he had cut spilling out of a chute and into the truck that was standing by for a trip to the grain elevator, I sensed the satisfaction he and his son, who now runs the family farming enterprise, must glean from their work. By the time I disembarked, I had added another dimension to my own connection to the land and gained a renewed appreciation for the people to whom it is both home and livelihood. Because of them and this place, the sounds of the harvest always will be sweet.